For me, just the word ‘Nutcracker’ evokes images of a magical world full of impossible things becoming possible. It conjures scenes of beautiful glittering trees, perfectly crafted vintage toys & the scary Mouse King through my mind. Most predominantly it brings visions of ballerinas dancing with intense emotion & grace. 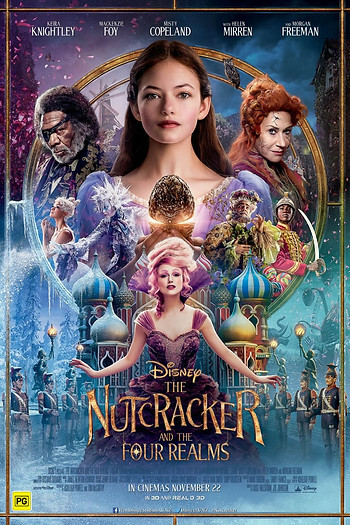 I have had a love of the original “The Nutcracker” (Both book & ballet) almost my whole life so although Disney’s The Nutcracker & the Four Realms is NOT the original E.T.A. Hoffmann’s story it does still maintain the key ‘Nutcracker‘ elements. Inspired by the original this film instead focuses on Clara the daughter of Marie (creator of the Four Realms) as the storyteller bringing a fresh twist to the story. Clara’s mother recently passed away &so Clara is feeling lost, alone & full of self-doubt. The annual Christmas party hosted by her godfather, Drosselmeyer, serves as her entrance into the world her mother created, a world that she had no idea existed. Thrust suddenly into leadership during a power struggle she must find herself & her confidence to know who to trust. While still maintaining the magical feeling of Christmas the film also celebrates invention, ingenuity & the intelligence of both Clara & her mother who created the world, to begin with. If you have children (especially girl’s) who are interested in leadership, science & invention then it’s a great starting point for them to be inspired, unfortunately, it stops just short of really making a big impact. For such an impressive cast I was a little disappointed. The performances were watchable however they lacked the sparkle needed for a film this glittery. The costumes & set designs dazzled at times while being underwhelming in others. The special effects & cinematography, however, were spectacular helping to create the usual Disney magic. for those who are scared of mice or clowns there are a few moments that might be terrifying! The Mouse King is a writhing, teaming collection of thousands of mice that left me with nightmares, but then I do have a “healthy” fear of mice. The scary moments are few & quick but I still wouldn’t recommend it for children under 8 years old without being able to skip past those moments! Growing up The Nutcracker has always been a special part of Christmas for me as I’m sure it is for many people! While this film is a fun, sweet film to watch some of the best moments for me was the original ballet woven through (stay for a performance that is truly beautiful during the credits). The Nutcracker & the Four Realms is a great Christmas movie for the older kids & a must see for those who love Ballet, science & invention. In Cinemas in Australia from the 22nd November 2018 – Find a cinema here. or win yourself a family pass here!